Vijayalakshmi “Viji” Das was brought up in Cuddalore in Tamil Nadu. Her father was a Gandhian and a socialist who had an influence on her. Viji, a woman of substance and a firm believer in “women empowerment” was deeply inspired from her mother and grandmother, who broke traditional norms and took up job in a society where women were prohibited from doing one. Doing something which impacts society and importance of being independent was something she had learnt since her early childhood. While writing her post graduate dissertation at the University of Madras about understanding the rural money market, Viji observed the exploitative nature of informal credit that prevented low-income households from climbing out of debt. During her stay in the villages she witnessed how these informal loans often came with prohibitively high interest rates that prevented low-income families from sending their children to school, accessing medical facilities and ensuring food and economic security. Women were especially restricted to informal credit sources because formal banks required documents, such as property titles and other forms of collateral, which women could not produce. 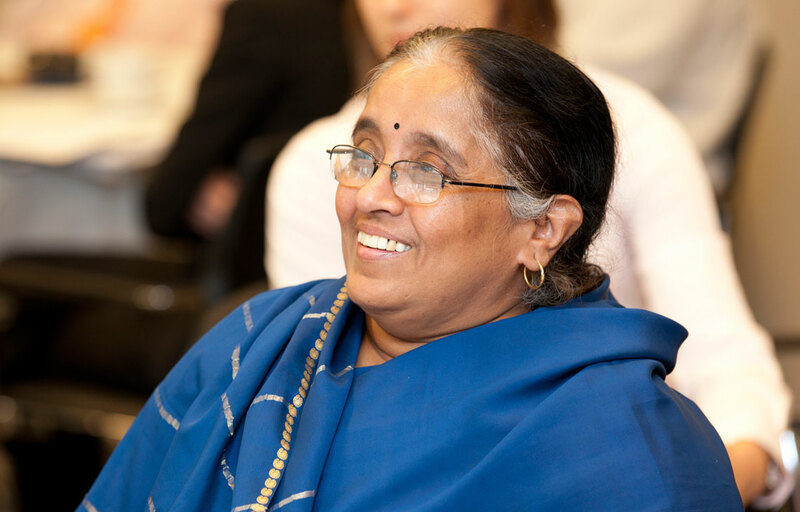 As it emerged in the 1970s, Viji saw microfinance as an opportunity for women to access finance without the obstacles imposed by traditional banks. After completing her Masters in Economics, Viji wanted to study further. Her home of Chennai was in turbulence due to social unrest. She was admitted to the School of Architecture and Planning in Ahmedabad with scholarship. It helped her open up and had a positive impact on her. It was for the first time she had left South India. In 1980, the global nonprofit Women’s World Banking was created to promote low-income women’s access to financial services thereby enabling them to engage in productive economic activities. The founder of Friends of Women’s World Banking, India (FWWB), Ela (Elaben) Bhatt, became Viji’s long time mentor. Ela is a pioneer in women’s empowerment who established the SEWA Co-operative Bank in the early seventies, which became one of the first affiliate organizations of Women’s World Banking. SEWA Bank being governed by cooperative laws of the state had its limitations in extending its services to other parts of nation. Elaben in turn promoted FWWB in 1982. In the year 1989 Viji met Elaben who was looking for a right person to lead FWWB. She chose to join the organization which though relatively small, gave her chance to strategize the path of organization. “What attracted me the most was the fact that organization works focusing on women and had board of women leaders working for financial inclusion,” said Viji. She joined the organization at a crucial stage of FWWB’s growth and worked on the strategic positioning of the institution by formulating the first business plan, building a committed team and its capital base. Under her leadership FWWB has expanded its operations across the country. FWWB, being a member of various networks, has played a significant role in building the sector. It had an advantage of having experience of different models that had worked in financial inclusion because it was one of the first few affiliates of Women’s World Banking. Institutions were given liberty to choose the models that will best fit for the cause in their locality. Technical assistance along with loans at low interest rates was provided for its implementation. Organizations were chosen based on focus and quality of work done by them. FWWB has reached out to more than 300 institutions with technical assistance and 200 with loan support. With cumulative disbursement of Rs 11 billion (as of 2010), FWWB has benefited lives of 2.6 million women. Currently FWWB is working with farmer producer groups as well as in energy, water and sanitation sectors. Viji remembers the first loan she disbursed from FWWB to an informal women’s collective and how inspired she felt when the women repaid their loan two months before the due date. Indeed, she finds that across India women have a 100 percent loan repayment rate. To this day, traveling around the country, Viji finds that while women are diverse across India’s cultures they share confidence, commitment and a willingness to take risk. To expand its outreach to more institutions, FWWB promoted a non banking financial company (NBFC) Ananya Finance for Inclusive Growth (AFIG) in 2009. In April 2010, FWWB turned over its microfinance activity, which works as exclusive entity to finance various microfinance institutions (MFIs) and mature farming production companies. To increase the outreach, small MFIs are nurtured with loans at competitive rates and technical assistance till maturity. They are further linked to banks for expansion. As AFIG’s managing director, Viji continues her passion to serve more low-income women with microfinance by accessing a larger lending book and capital base due to AFIG’s license from the Reserve Bank of India to operate as a non-banking finance company. Agriculture in India employs 50 percent of total work force. Small and marginal farmers are financially excluded despite of government intervention. They are largely dependent on money lenders for financing. High interest rates and exploitative terms of borrowing reduce their earnings drastically. Formation of FPOs increased the bargaining power of farmers. AFIG is extending its financial support to FPOs with minimum documentations of its members. Providing finance at the right time to FPOs with low interest rates plays crucial role in increasing the income. In 2003, Indian School of Microfinance for Woman (ISMW) was promoted by SEWA Bank and FWWB to address the capacity building and research requirements of the sector. Viji, who is the director and founding trustee of ISMW, played a critical role in conceptualizing and making it a success. In 2005, ISMW formed a relationship with Citi Foundation and launched the Citi Center for Financial Literacy (CCFL) as a department of the sschool exclusively dedicated to spromoting financial literacy among poor women. CCFL has promoted a network of organizations namely National Alliance for Financial Literacy (NAFiL) to make financial literacy a movement across India. NAFiL was started with 10 founding members, FWWB being one of them. The network of FWWB has played a vital role for increasing the outreach of drive which has benefited 3.7 million women. Drashti Patel earned her MBA from Xavier Institute of Management Bhubaneswar and joined Ujjivan Financial Services, Ltd. in April 2013 in the fifth batch of Management Development Program. She has worked with the credit department and is currently handling Secured Home Loan business in Gujarat. Ramatolie Saho is a senior associate with Women’s World Banking’s Product Development Team. She joined in 2012 as part of the organization’s Fellowship Program and transitioned into a permanent role with the Product Development Team in 2014. Ramatolie supports both the Savings and Market Research teams including delivery of customer research initiatives that inform the design and delivery of financial products and services for low-income women.